The word derives from two Greek words: Orthos meaning ‘Right’ and Doxa meaning ‘Belief’ or ‘Worship’. Thus Orthodoxy refers to the practice of the right belief and worship. The Orthodox Church of today claims to be identical with the undivided church of the past. Autonomous (‘self-ruling’) churches. These cannot appoint their own bishops but have them confirmed by an Autocephalous church. In all other respects, they have complete self-government. The Oriental Orthodox church likewise is composed of six autocephalous churches – the Coptic, Ethiopian, Eritrean, Syriac, Armenian and Indian (Malankara) churches. * This is sometimes called the ‘Chalcedonian Definition’ with the full text available on the Creeds of Christianity page. Due to their belief in the one nature, the Oriental Orthodox churches were labelled ‘Monophysite’ (physis is the Greek term used for ‘nature’). The label is disavowed by Oriental Orthodox Christians, who prefer the term ‘Miaphysite’. In the writings of Cyril of Alexandria (376-444), mention is made of the one nature of Christ, as the incarnate God, together with a union of natures. Miaphysitism argues that Christ as the word of God incarnate has a single nature, containing both human and divine elements, and united without any degree of separation or change. Both Eastern and Oriental Orthodox have met on several occasions to provide a framework toward eventual reunion. The last such meeting was held in Geneva in 1993. NOTE: Generally, from now on, this website will use the term ‘Orthodox’ to refer to the Eastern Orthodox churches only. The claims of the Pope*, as Bishop of Rome, to be the supreme head over the church. Differences in language and culture – Latin was widely used in the west, Greek in the east. Liturgical differences such as the use of bread that was leavened (East) or unleavened (West) in the Eucharist. * The head of the Coptic church in Egypt and the Eastern Orthodox Patriarch of Alexandria & all Africa are also styled with the title ‘Pope’. A significant disagreement between Rome and Constantinople took place in 858, with the appointment of Photius (c. 820-891) as Patriarch of Constantinople. His successor (Ignatius I) had been deposed by the eastern emperor Michael III (839-867), but Ignatius refused to step aside and his case was taken up by Pope Nicholas I (c. 820-867). Photius found himself excommunicated by the Pope in 867 and he replied in kind. The dispute was not settled until Ignatius died in 878. ..and in the Holy Spirit, the Lord, the giver of life, who proceeds from the Father and the Son. The West inserted this into the creed at a provincial church council in Toledo, Spain in 589. Ostensibly this was done to protect against the Arian heresy, which denied that Christ was co-eternal and co-equal with the father, but was simply a created being. The Orthodox churches objected to the addition arguing that firstly, the addition was done outside of an ecumenical council and so could not be accepted by the whole church, and secondly (and more importantly), the addition implied that there were two sources of deity in the one Godhead. In 1014, the Filioque was officially accepted in Rome. The separation became more intense until in 1054, Pope Leo IX and the Patriarch of Constantinople, (Michael I) both excommunicated each other. Their respective churches now claimed the title of the ‘One true church’. In 1204 the Crusading armies looted Constantinople and in doing so, reinforced the separation. Attempts were made in 1274 and 1439 to reunify East and West, but both attempts failed due to lack of support from the East. In 1453, Constantinople finally fell to the invading Ottoman armies, striking a decisive blow against the unity of Christendom. (The former Church of the Holy Wisdom in Constantinople, now known as Istanbul). With regard to the ecumenical movement within Christianity, the Orthodox church is a member of the World Council of Churches, which also contains most of the main Protestant denominations. 1. Patriarch, 2. Exarch, 3. Metropolitan. Orthodox Church in America (Became Autocephalous in 1970 from the Russian Orthodox Church). 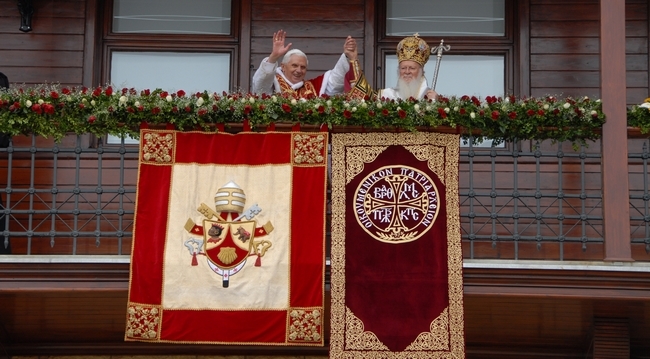 Bartholomew I and Pope Benedict XVI in Turkey, 2006. NOTE: An Orthodox view of Protestantism is given in the Orthodox Q and A section. The Orthodox church affirms that there is one God, in three distinct persons. As with other Christians, the Nicene Creed is used as a profession of faith. The only difference being, as we noted above, that the Holy Spirit is said to proceed from the Father alone. A Russian icon depicting the council at Nicea (325). As in the Catholic Church, the Orthodox Church accepts the idea of Apostolic succession, i.e. the idea that the bishops follow an unbroken line of succession from the Apostles. Doctrinal authority resides in Tradition (capital ‘T’): The Bible, church councils and creeds etc. The writings of the church fathers are also considered important. This Tradition (Greek: paradosis) is distinguished from ‘tradition’, which includes local and national customs. Orthodoxy believes that the Holy spirit acts to guide the church into the truth. Biblically, there are a number of additional books (which are known as deuterocanonical (Greek: ‘Second Canon’) in use in Orthodox Bibles and Roman Catholic Bibles, alongside the normal canon of 66 books of scripture as used by Protestants. 1 Esdras, 2 Esdras, Tobit, Judith, Additions to Esther, Wisdom of Solomon, Ecclesiasticus (Sirach), Baruch with the Letter of Jeremiah, Song of the Three Young Men and Prayer of Azariah, Story of Susanna, Bel and the Dragon, Prayer of Manasseh, 1 Maccabees, 2 Maccabees. There are seven Sacraments (known as ‘Mysteries’ in Orthodoxy). These are: Baptism, Chrismation*, Eucharist, Holy Orders, Penance, Anointing of the sick and Holy Matrimony. * Known as Confirmation in the West. As in the Catholic church, the Saints are venerated and special attention is paid to Mary, who is often called the Theotokos (Greek: ‘God-bearer’). However, Orthodoxy does not accept the Catholic view that Mary was immaculately conceived. An overview of the Orthodox view of Mariology is found in the Q and A section. An Orthodox Hymn to the Virgin Mary, known as the Axion Estin. Finally, Orthodoxy agrees with the Catholic church that Christ is truly present in the Eucharist and that this and the other Holy Mysteries convey grace to those who receive them worthily. A detailed article on the differences between the Catholic and Orthodox churches is given by the Orthodox Research Institute. The church accepts the first seven ecumenical councils as having authority for dogmatic belief. In these Councils, the church believes that it was guided by the Holy Spirit to determine truth from falsehood. Nicea I (325) – Upheld the view that Christ was of one essence with the Father (thus repudiating Arianism) and adopted the first form of the Nicene creed. Constantinople I (381) – Revised the Nicene creed to the form now in use. 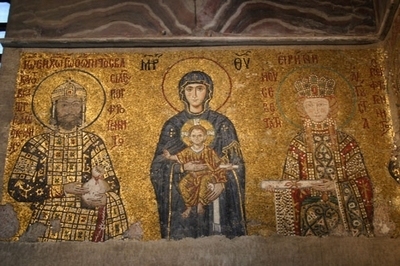 Ephesus (431) – Affirmed Mary as Theotokos i.e. ‘Mother of God’, thus repudiating Nestorianism. Chalcedon (451) – Affirmed the doctrine of two natures in one person (the ‘hypostatic union’) in Christ and thus rejected the Monophysite doctrine of Eutyches. Constantinople II (553) – Affirmed the teachings of the previous councils. Constantinople III (680-1) – Repudiated the Monothelite heresy by stating the view that Christ has two wills – one human, the other divine. Nicea II (787) – Restored the veneration of icons following the iconclastic controversy. Orthodoxy maintains a sense of the transcendence and immanence of God in a way quite unfamiliar to the west. The use of the term ‘Mysteries’ for what is known in the west as ‘Sacraments’ underscores this. The essence of God – That which is unknowable to Man. The energies of God in which God has revealed himself to us. 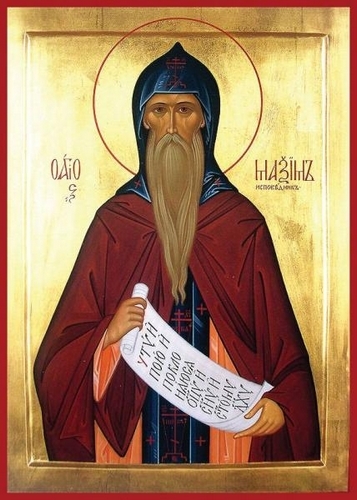 Simply put, Orthodoxy maintains that we can know God directly by his Uncreated Energies which are nothing more or less than his self communication to us, but we cannot know his nature which remains forever, completely and infinitely beyond our perception and comprehension. This prayer is used by other traditions within Christianity, but it is popular in Orthodoxy, where it is seen as an important part of the faith, drawing the soul into deeper communion with God. The writings of those in the Hesychast tradition were collected together in what became known as the Philokalia (Greek: ‘Love of good things’). The aim of all Orthodox believers is to obtain Theosis, which might be defined as likness to, or union with God. Theosis is seen as the ultimate goal and the main purpose of human life. Theosis has three stages; the first being purification (katharsis) and the second illumination or the vision of God (theoria) and sainthood (theosis). 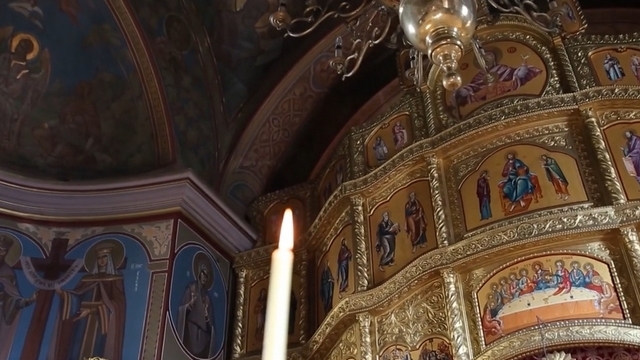 One of most distinctive features of Orthodoxy is its use of icons in worship. These are considered to be much more than merely pictorial representations of Christian figures. Icons act as a form of veneration or proskynesis, though as the church points out, the veneration is always given to the person represented by the icon, and not the icon itself. Basil of Caesarea worded it thus: The honour paid to the image passes to the prototype. There was a serious dispute over the use of icons in the 8th and 9th centuries (known as the Iconclastic Controversy). It began in the reign of Emperor Leo III of Constantinople. Although the ecumenical council at Nicea in 787 restored the use of icons, the dispute was not finally settled until 843. To this day, this settlement is commemorated on the first Sunday in Lent in the Feast of Orthodoxy. 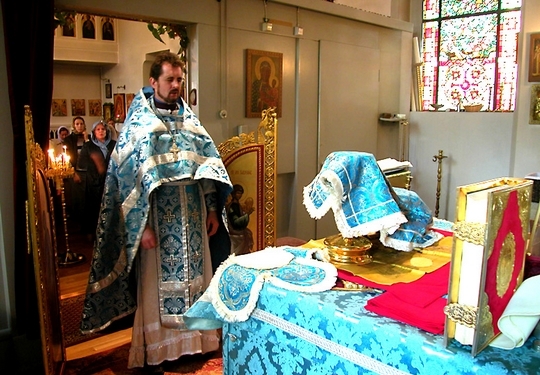 An Orthodox service (known as the ‘Divine Liturgy’) is mainly sung. There are several liturgies used, but ordinarily that used is the liturgy of St. John Chrysostom (347-407), Bishop of Constantinople. St. John was famed for his eloquence in preaching (‘Chrysostom’ is a Greek phrase meaning ‘Golden-mouthed’). The Divine Liturgy is discussed in the section The Mysteries. Divine Liturgy in an Orthodox Church. 6 January: Theophany – The Baptism of Jesus Christ by John the Baptist (Mark 1: 9-11). 2 February: The Presentation of Christ in the temple (Luke 2: 22-35). 25 March: The Annunciation (Luke 1: 26-38). Sunday before Pascha: Palm Sunday (Matthew 21: 1-11). 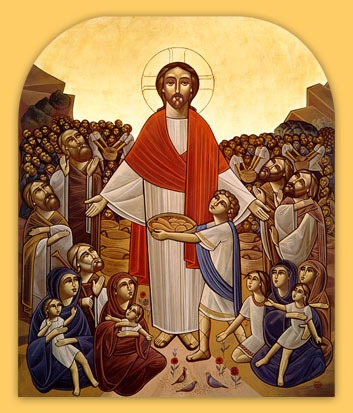 Fifty days after Pascha: Pentecost (Acts 2). 6 August: The Transfiguration (Luke 9:28-36). 15 August: The Dormition (Falling asleep) of the Theotokos. 8 September: The Nativity of the Theotokos. 14 September: The elevation of the Holy Cross. 21 November: The presentation of the Theotokos. 25 December: The Nativity of Christ. Note: The dates above are those used by those Orthodox Churches which have adopted the revised Julian Calendar (similar to, but not the same as, the Gregorian Calendar used in Western Christianity). These are known as New Calendarists (NC) in distinction from the Old Calendarists (OC), who maintain the use of the original Julian Calendar.